Pick-Your-Own Berries ~ Learn, Live, and Explore! 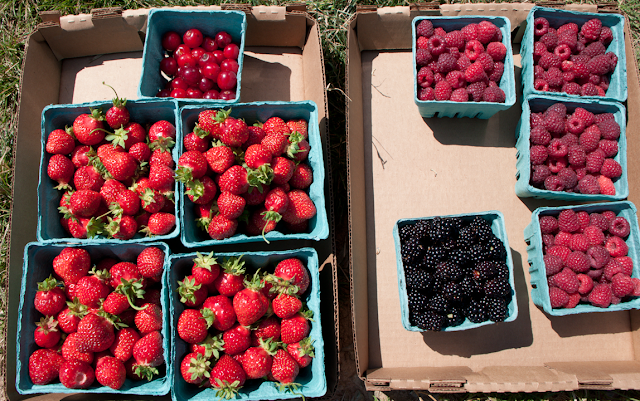 We headed out today to pick some berries at a local farm. When you live in Northern Virginia, the closest farms are out in Fauquier County, or about a 60 minute drive from inside the beltway. The scenic drive, alone, is worth it though. I grew up picking my own berries in Oregon. Every summer, my mom would take us out to Wilhelm Farms in Wilsonville where they had rows upon rows, in multiple fields, of ground skimming strawberry bushes. I swear, Oregon berries taste like no other berry you can pick in the world or get from the grocery store. I don't know if it's the rain or if it's the variety, but they are the sweetest and juciest berry. I remember my mom would take us out there for the day, every June after school was out, to pick as many berries as we could. As a kid, of course, I only picked probably one flat to my mom's four - because I ate the other three! Seriously, I must have ingested a ridiculous amount of pesticides when I was young, but fortunately I turned out okay! Oregon berry shelf life is very short, so when we got home, my mom would slice up all the berries, sprinkle them in sugar, then pack them into several ziploc freezer bags. 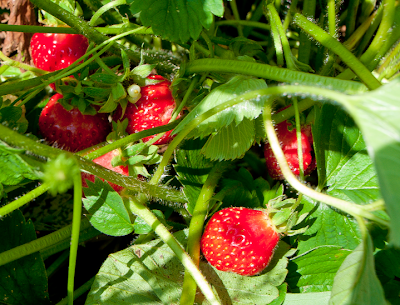 This meant that for the rest of the year, we always had strawberries we could thaw out for weekend breakfasts. Yum!! 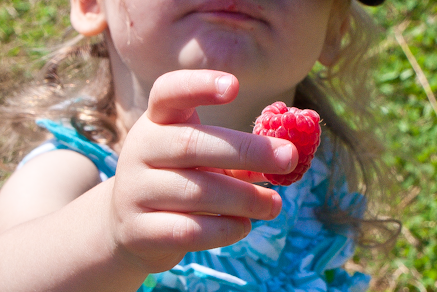 So, today my friend and I tried to replicate my berry picking memories by taking her daughter out to Hollin Farms. 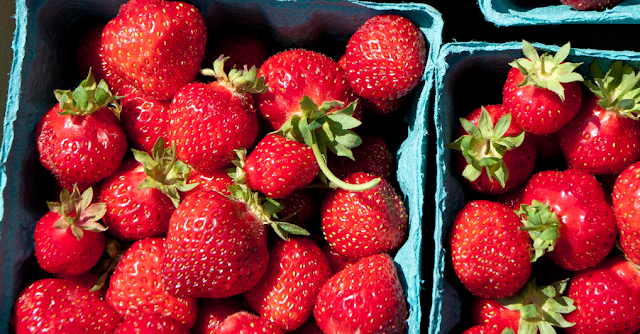 In June, the farm allows locals to pick strawberries, raspberries, blackberries, sour cherries, plums, and apricots. We both aren't big fans of plums and apricots, so we stuck to the berries. Like me, my friend's daughter ended up eating half of what she picked. Love it! It's funny how you remember the happier parts of things you did as a kid. I tell you, after only filling one quart of strawberries, my back and knees were already complaining, and even in low humidity the sweat was pouring! And I don't remember having to dig so much into the plants to find the berries. After about an hour and a half at the farm, we had successfully picked four quarts of strawberries, four pints of raspberries, a pint of (sour!) blackberries, and a half pint of the tart cherries. I will be freezing the strawberries for future breakfasts, and tonight, I got all the ingredients to make an amazing batch of fresh raspberry ice cream. Yum!! Our berry load for the day! The plan was that after the berry farm, we were going to go to a lavender farm I had heard about recently, Seven Oaks Farm. Envisioning the endless rows of lavender of Provence, France, I questioned the GPS when it had said we arrived and we saw nothing purple at all. We headed down the driveway only to discover that a lavender farm was, in fact, simply an oversized garden full of lavender plants. While the berry farm had been free admission, pay for what you pick, the lavender farm had the gall to charge $6 for adults, $3 for children, just to walk through this garden - on top of the $0.12 per stem should you choose to cut them. Disappointed, we ended up leaving. Lesson learned, if I want to see lavender, the only place to go is to its true source. Plus, who doesn't want to go to Provence in the summer? I do! No excuses required!